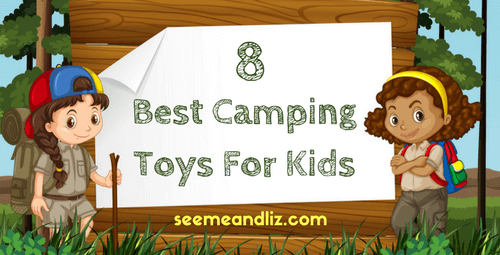 Seeme & Liz > Learning Toys (2-4 year olds) > Pretend Camping Toys For Kids – These 8 Are Must Haves! 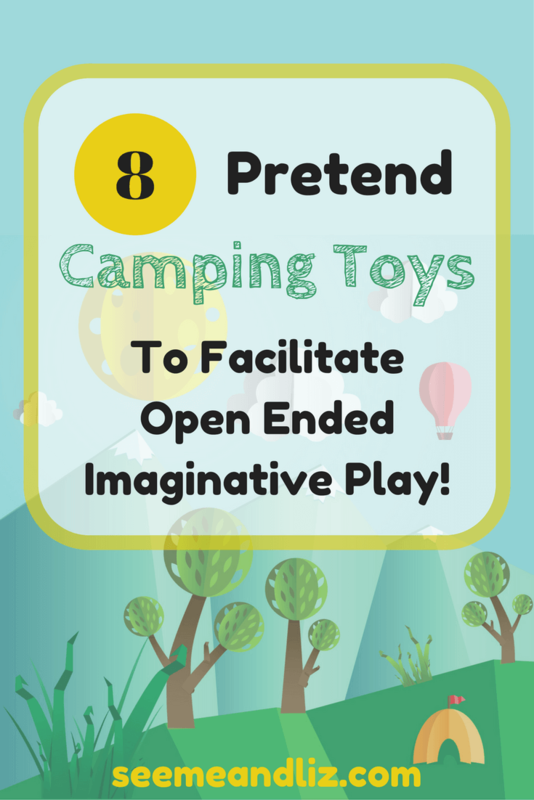 Pretend camping toys for kids are another wonderful way to encourage creative, imaginative and unstructured play. Actually, it’s only somewhat unstructured but, all of the skills I mentioned can still be facilitated by pretending to go camping. 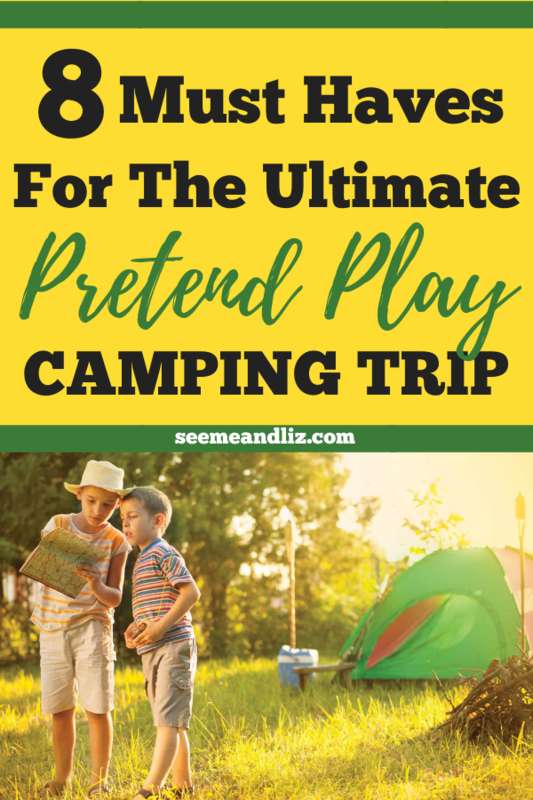 The reason that I say this type of play isn’t completely unstructured is because an adult has probably given the suggestion of going on a “camping trip”. But if the suggestions is all that is given and the child gets her toys together and begins acting out different scenarios either independently or with peers, so much learning is happening and the play is no longer structured. A camp stove is very similar to a kids play kitchen, just a much smaller version of it. So the skills that can be strengthened or gained are very similar. With the grill and go camp stove from Educational Insights, your child can also learn new camping themed vocabulary or learn new words for existing words. 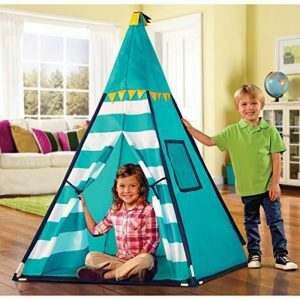 For example: what is the difference between a tent and a teepee? Which one would you take on your camping trip? Another word would be warm vs. cozy. This set includes a coffee pot, pan and 4 utensils. The entire unit comes in a child friendly carrying case. For more ideas on language development and learning, make sure to read The 5 Best Kids Play Kitchens: They Will All Encourage Language and Learning!. Simply swap the word “kitchen” for “camping” or “camping stove” to stick with the camping theme. Although this isn’t always necessary. This kids play lantern also doubles as a star projector! So when it’s time to turn the lights out your little camper can fall asleep under the stars, even if it’s an indoor camping trip! A flashlight is a must have for any camping trip. But so is a lantern! You can use it to find your way around in the dark, or have a fun shadow puppet show. Talk about some of the animals you might see outside on a camping trip. Discuss why having a lantern is a must have for a camping trip. This kit comes with some additional camping necessities. And, it also comes with a lantern, though not as durable as the Fisher Price Kid Tough Explorers Lantern, and a pan. Some of the other nine items include a pretend watch, shovel, canteen, first aid kit, utensil set, compass and stove. This set works well for introducing and explaining new vocabulary words such as first aid kit, compass and canteen. Sit back and watch what your child does with these items. It will vary depending on his age. Following your child’s lead is very important when it comes to a child’s learning and development. Every camping trip, real or pretend, needs a tent (or teepee). Because these are such great toys for natural learning, you can click here to read some of my language and learning tips. Binoculars are a great addition to camping trips. Your child’s imagination can soar talking about all of the things he sees on his camping trip. Perhaps it’s a bear, or maybe a monkey if he’s camping in the jungle! This pair of binoculars is made for pretend play, which is why they cost less than $10. But they do actually magnify. If your child is under the age of 4 I would recommend these. For more realistic binoculars that are still meant for a child, these are a great option! Everyone needs to eat when they are camping. This Melissa & Doug wooden sandwich set should satisfy even the pickiest eaters! You can also make a hamburger! Talk to you child about how to make a sandwich. What do you need first, next and last? This is a great way to work on sequencing skills! You can also introduce new vocabulary to your child. And as an added bonus your child can work on fine motor skills with this set, including grasping skills. This is because this sandwich set can be cut! After a sandwich has been made, cut it up! Going camping and not having a campfire takes all of the fun out of camping! 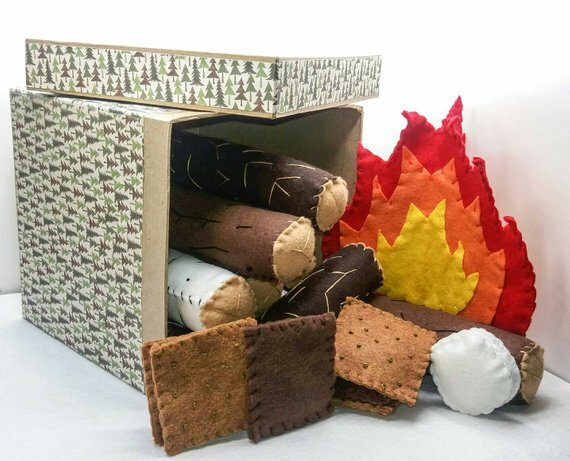 This pretend plush campfire set will make your camping trip complete! While this isn’t a camping necessity, books can help pass the time while en route to the campground. And this is a great way to read about camping to your child if she has never been camping before. Join Fred and Ted on their camping adventure! Now Your Child Is All Set To Go Camping! 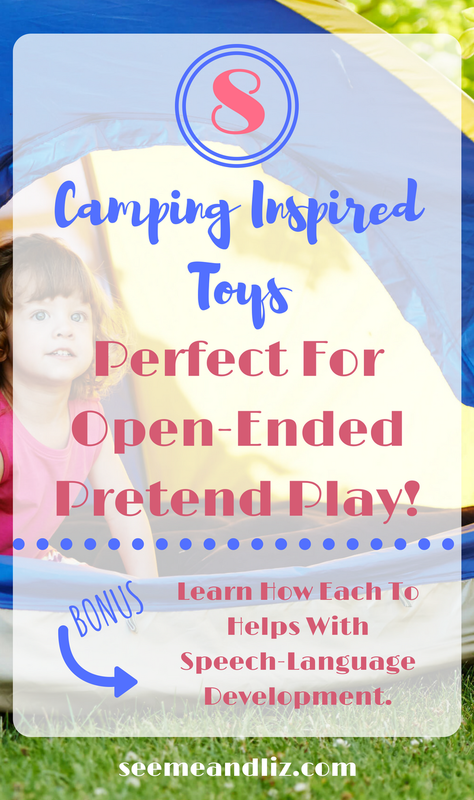 These pretend camping toys for kids should inspire you are your little one to take an adventurous camping trip in the comfort of your home or backyard! 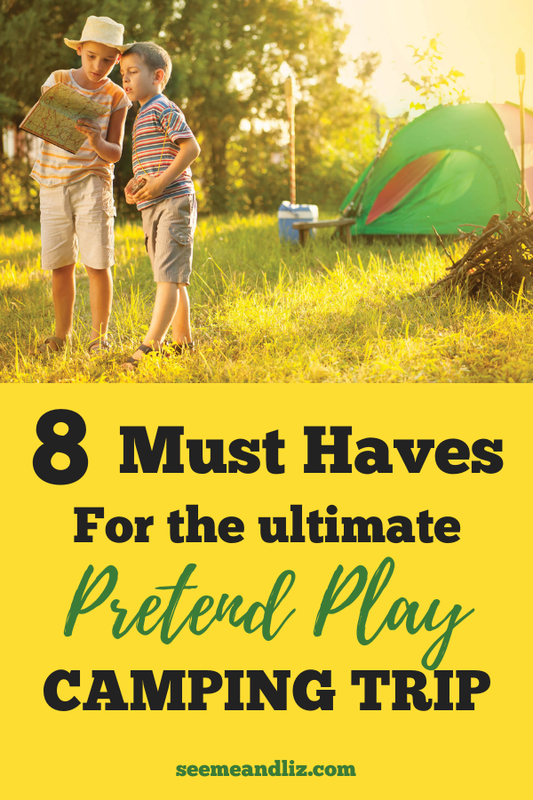 These also make great toys to bring along on a real camping trip so your child can participate in everything that is going on! Hi! What a great site! My favorite item on this list is the play tent. My kids have at least 3 tents around the house. They double as ball pits here. LOL I like the fact that the tent can become a house, a garage or a tent for sleepovers! Kids love imaginative play and so do I! You’re right Ally! Play tents are great for pretend play as they can be so many things. My kids have even turned theirs into a restaurant (and also a ball pit). I love seeing all of the imaginative ideas they come up with! This is a great webpage! My son loves to be in the kitchen with me and likes to cook with me, and he also loves tents, so all the toys that you’re recommending here look really appealing. He doesn’t know much about camping yet, but maybe this summer we will camp out in our back yard:). Thanks Ayako! You can always try “camping” indoors first. It’s very simple to set up and it can be done anytime of the day. You don’t need to spend the entire night in the tent or fort!